2016 Was The Hottest Year On Record, Ever. 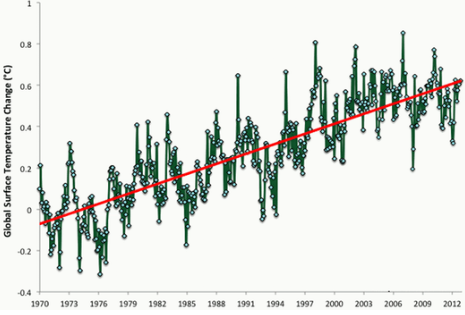 We show some raw data below that is hard evidence of global temperatures rising, ice melting, and ocean levels rising. It is our hope that it will convince some visitors to this web site that these changes in the world's environment is a serious problem. However, a succession of Gallup polls shows that the percentage of U.S. adults who believe that the effects of global warming are evident has increased in recent years. It was 49% in 2011, and has risen to 62% in 2017, an average rate of 2.2 percentage points per year. Some reasons for this low level of concern about climate change among religious and social conservatives is that many of them distrust scientists. There has been a steady conflict for over the past century between science and religion. Much of it has been caused by many Christians having interpretated of the Bible as saying that the Earth and its living "kinds" were created by God less than 10,000 years ago, Meanwhile, most scientists believe that the Earth coalesced 4.5 billion years ago, that life started as a single-celled animal, and evolved over time to the current proliferation of living species. Further, life on Earth is continuing to evolve. Step 2: Conclude that climate change is mainly being caused by human activities. Dr. Joe Romm, founding Editor of Climate Progress, writing for Think Progress, posted a note titled: "We did it again! [2016-] November is hottest on record." "... These data show that not only is November 2016 the hottest on record, but [that] there is an ongoing, annual trend." 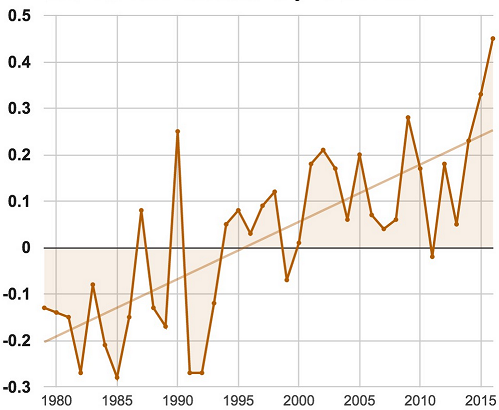 The average rate of warming is 0.18ºC/ per decade or 1.8ºC per century. That is 0.32ºF/ per decade or 3.2ºF per century. The consistent rise over recent years to 2013 to 2016 is probably partly driven by El Nino which reached a peak in 1016 and started to decrease during 2017. It is a cyclical phenomenom and will increase again in a few years. The sloping line shown on the graph is generated by the equation: [y = 0.018 * x - 36.025], where Y = temperature in ºC, and X = year. 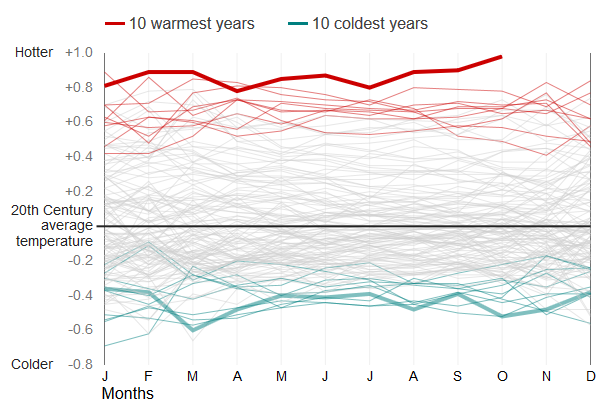 The ten warmest years are shown highlighted in red, with 2016 -- the warmest -- shown in bold. They all occurred in the 21st century. The ten coldest years are shown in green with the coldest shown in bold. They all occurred in the 20th century. Cause: Analyses of recent papers by climate scientists show that a concensus has been reached that global warming/climate change is real. Also among those papers that mentioned the cause of climate change, 97% attribute the cause to to human effort. The main one is the burning of fossil fuels which increases the levels of greenhouse gasses in the atmosphere. In effect, these gasses act as a blanket around the earth. Carbon Dioxide (CO2) is a the most important of the greenhouse gas. They keep in heat by reducing the radiation of the Earth's heat into space. 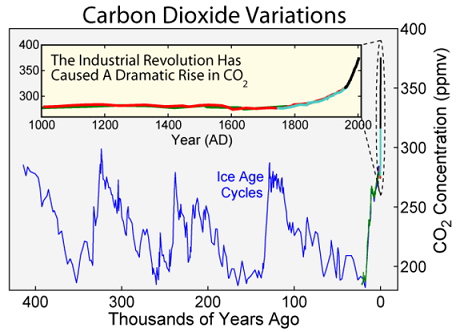 There is an optimum level of CO2 in the atmosphere; it is about 240 ppm. If all the greenhouse gasses "went away" then the Earth's temperature would drop, to an average of about -0.4º F (-18º C), compared with its current value of 59º F (15º C). 8 However, climate researchers have concluded that the present level, in excess of 400 ppm, is causing significant global warming. "The present CO2 concentration is the highest in at least the past 800,000 years and likely the highest in the past 20 million years." 9 Virtually all climate scientists agree that this recent increase was due mostly to human activity, particularly the burning of fossil fuels, which directly add to the CO2 level. Another cause is also by humans. It is deforestation, which slows down the absorption of CO2 by trees and plants, and their emission of Oxygen into the atmosphere. The extent of sea ice in the Arctic varies during the year. It typically reaches a maximum during May and a minimum during September. 5 The BBC published a graph prepared by the National Snow and Ice Data Center showing the yearly minimum extent of sea ice between 1980 (when it was 7.8 million square km or 3.01 million square miles) to 2015 (when it was 4.6 million square km or 1.77 million square miles). One result of this loss of coverage is that polar adventure expeditions through the Arctic's NorthWest Passage are now available.